If you love to mix and match a vibrant and unique range of fabrics, Fair Price is where you can score on fabrics on a shoestring budget. 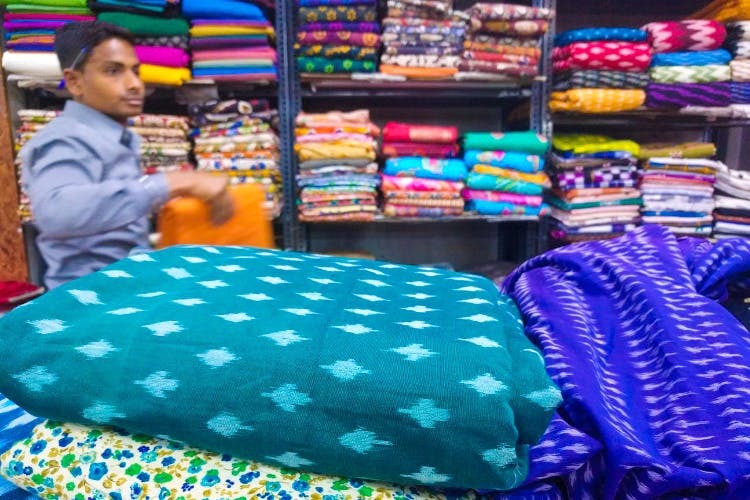 Just as the name suggests, Fair Price offers fabrics and readymades at reasonable prices, and shopping here won't leave you broke. Walk past those readymades and step into their fabric zone where you'll find two-toned fabrics (INR 300 per metre), ikat (INR 150 and upwards), Benaras Silk (INR 500-5,000), kalamkari (from INR 80) along with fancy brocades that are grand enough for wedding couture. Men, don't lose hope as you can take your fill at their cut pieces section that has formal wear for the dapper you! But what we also thought was interesting about the store is that they have a seconds' section, which is basically a set of shelves where fabrics (With minor printing errors, negligible to the human eye) that Fair Price deems unfit land. And these are far cheaper, so you can explore this section too. The staff isn't very responsive when it comes to helping you out, so we wish they'd take more interest in just getting those exquisite pieces of fabric hidden in the closet, somewhere.